I will never forget my first visit to MCS. Standing outside, I strained my eyes to obtain a slight glimpse of what was inside. MCS captivated me with its incredible beauty and power. Years later I would return, camera in hand for a much closer inspection. Clearly I am not the only one who was captivated by MCS. During those early visits in 1999 people flocked to the building like tourists. Some came to take photos, others simply to enjoy the surroundings and others came with more sinister motives of smashing and vandalizing. It was almost a park-like setting in which the MCS retained its historic role as a public place. Eventually the sheds came down and security went up. I've mostly stayed away from the building the past 5 years but often when I pass I still see people parking in front of the building and gawking at its massive bulk. 16 years after it closed the MCS still draws a crowd. Over the years I've heard a number of proposals for the building. Homeland security offices and a business center have both sprung from the rumor mill. The latest proposal is Mayor Kilpatrick's plan to convert the old depot into the new headquarters for the police department. 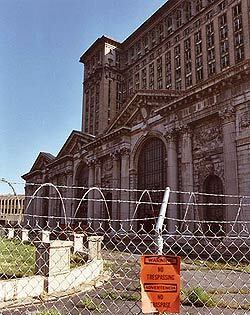 While the early news sounds promising the plan also calls for the shuttering of the current Albert Kahn headquarters. One white elephant for another. In my opinion the police headquarters is not the best use for the station. However, at this point I am almost willing to support whatever plan puts the building back in use. The questions facing Detroit and preservationists over the following months will be can the proposal be accomplished when so many have failed and what will the fate of the current headquarters be should the police move to MCS? Time will tell. It sure would be ironic to think that the most UEed abandoned landmark in Detroit could become home of the city's police.